In continuation of my last post, hubs, Lil' Z and I ventured out to the grocery store(s) today....and it reminded me of why I despise grocery shopping on Sundays. It was a bit of a zoo....between a number of tottering seniors (and yes, I FULLY realize not all seniors totter...but these ones WERE tottering, particularly in the produce section), and sprawling families with massive strollers and rangy kids everywhere...ugh. Anyway, here is our list. I've italicized the off-list stuff we bought. As I said, there were a few things I couldn't find at FB and a couple of things I forgot while we were there. So we stopped in at Loblaws on the way home. Now, keep in mind this total isn't really fair....there are a few things on the list that weren't planned for, some that are expensive (like the syrup), but will last for MUCH more than what I need this week. AND...there's a lot of stuff I already had on hand - like 2 pork tenderloins (which would have been about $7, because I only buy it on sale) and the fish. At any rate, it's a pretty fair representation of what a week of planned meals will cost you. This makes WAY too much food for 2 people (Lil Z doesn't count, as she gets it all second-hand!). This will make dinners for 4-5 people every night - we eat the leftovers for lunch the next day, but if you had a larger family to feed, this would definitely feed 'em. I do let myself stray from my list, mostly for sale items, or for pantry staples...we don't have a super strict grocery budget, so it's not a big deal for us. 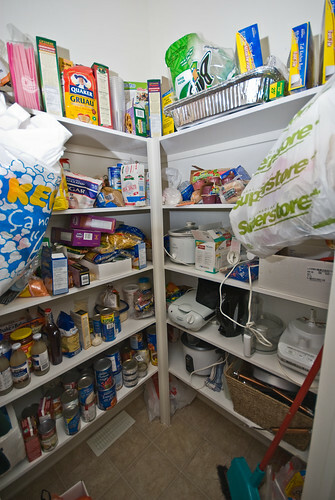 I also keep a pretty well-stocked pantry (okay, ridiculously overstocked, as you may witness below...oof). I think I should probably do an 'eating for free' week again soon, eh? wowzers! you can get 1/2 pound of feta for under 3 bucks? how is that possible...here these little tiny containers are like 4 bucks? i'm going to check out feta prices next time we're at the store. Nice totals. 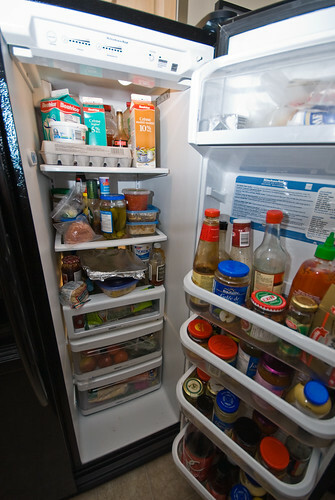 Mine would not look like that because it is missing a few vital things: cereal and milk. My 2 kids, and hubby, go through 3-4 club sized boxes of cereal a week, sometimes more.